Glen Cove, NY... The Holocaust Memorial and Tolerance Center of Nassau County (HMTC) and the Sid Jacobson JCC present a performance of The Pirates of Penzance, in Yiddish, performed by The Gilbert and Sullivan Yiddish Light Opera Company. The performance will take place on Sunday, March 26, 2017, at 2 p.m. at the Sid Jacobson JCC, 300 Forest Drive, Greenvale, NY, 11548. Tickets are $18 each. The Gilbert and Sullivan Yiddish Light Opera Company’s productions feature beautiful costumes and bright, colorful sets. The production is in Yiddish with English narration. 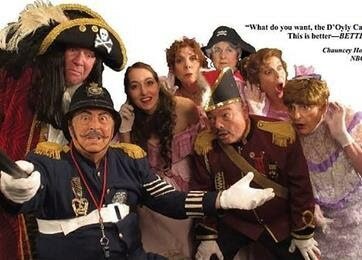 Woven into the original plot of The Pirates of Penzance are Jewish experiences and idioms. You do not need to know Yiddish to enjoy this interpretation! The Gilbert and Sullivan Yiddish Light Opera Company was founded in 1954 and has performed up and down the East Coast as well as internationally. To order tickets for the Gilbert and Sullivan Yiddish Light Opera Company’s performance of Pirates of Penzance call (516) 484-1545, email registration@sjjcc.org or order online at https://onlineedge.sjjcc.org/OnlineEdge/event63.html. For more than 20 years, HMTC has been fulfilling its mission to teach the history of the Holocaust and its lessons through education and community outreach. For more information, call (516) 571-8040, visit www.hmtcli.org or find us on social media at Facebook.com/HMTCNY and Twitter.com/HolocaustTolCtr.